Product: Tie Downs. 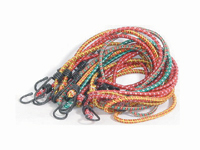 Multi Colored Bungee Tie Downs. Sizes: 12", 18", 24", 30", and 36"